The Griffin (also spelled griffon or gryphon) is a magical animal that comes equipped with the hind end of a lion and the front end of an eagle. This would cause the beast some probl ems, I’m sure, because, if you’ve ever eaten a chicken and seen it’s bones, you know that the legs on a bird are his hind legs. His wings are the equivalent of our arms. Therefore, the Gryphon has two sets of hind legs, which would make anyone a little grouchy. The picture at the top is from Alice in Wonderland. His “elbow,” just under his tired beak, is really the heel on a bird (they walk on their toes) so, as a picture, it works (because the artist left the knees out!) The limb appears to bend in the right direction, and the animal is believable. As a real animal it would be a bit awkward, wouldn’t it? 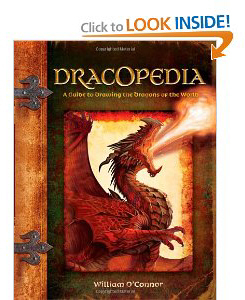 Now, let’s learn how to draw a magical gryphon! The idea of a hippogryph is not really Ms. Rowling’s idea, of course. 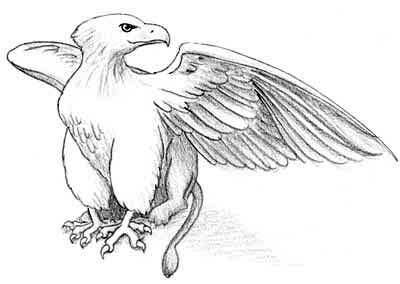 Like almost all of the magical animals from the Harry Potter books, the hippogryph is taken from ancient mythology. Buckbeak, according to the ancients, had a gryphon for a father, and a horse for a mother. If you would like to draw Buckbeak, you can use these instructions, but substitute the lioness’ back end with the back end of a horse. One difficult thing about drawing an animal that is made up of parts of different animals is finding models that are situated in similar poses. You want your back end going in the same direction as your front end, after all. We also need to figure out how to stick on the extra limbs – one main characteristic of real animals (at least the ones with backbones) is that we all have four limbs, be they arms, legs, or wings. Six is not part of the normal plan. But we need to make it look believable! I found photos we can use that are close, but you may want to do some surfing on the web, using the research method mentioned in the chapter on the Serpent, to find pictures that you like better. 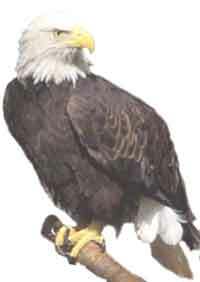 The eagle showing off his wings is a Golden Eagle, the great head shot up above is an eagle from Australia called a Wedge Tailed Eagle. 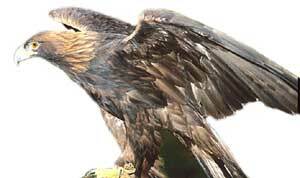 You might like the head down below better, but I thought the Wedge Tailed Eagle was quite elegant. 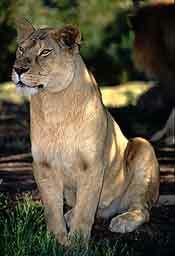 We’ll use the chest from the Bald Eagle, and the Lioness will loan us her rear end. Whew! To start off this very complicated drawing, you might want to do a little more Internet surfing and look at some sites with drawings of Gryphons. People spell the word in a lot of creative ways, so be sure to search for griffin and griffon, too. At first I thought that it would be easiest to get all the parts to work together if we draw the front and back half of our Gryphon on separate sheets of paper and then put the eagle half over the lion half, moving them around ’till we get something that looks reasonable. But I soon discovered that it is easiest to make the critter look real if the body, including front legs, of the lioness is sketched in first. 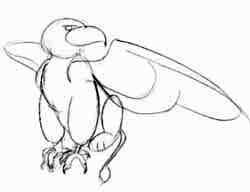 I then used the basic sketch to change the front legs into eagle parts, and added the wings. Now we have a very rough drawing of an animal that seems to have all the parts in the right place. I will use this drawing under a clean sheet of paper, and begin to put in the details. I will pay special attention to the eyes, and have a lot of fun with the feathers. Since all the lion parts are behind the eagle parts in the drawing, we won’t have to work at getting the feathers to turn into fur. You’ll notice that eagles and hawks have a ridge over their eyes that acts like a built-in baseball cap, keeping the sun out of their eyes. They hunt by sight (they can see about three times as well as we can!) and the bony ridge protects their eyes. It also gives them a somewhat sinister look. In addition, they have an upturn to the beak that makes it look like they’re smiling, in an evil sort of way. These qualities are great for adding character to our Gryphon.